Brand new for Lego in 2009 is their new line called Power Miners. There is a great plot that goes along with it featuring mysterious crystalline monsters who have tunneled from beneath the planet's surface to Lego world! There are five types of the monsters - each with their own strengths and weaknesses. We absolutely love the color scheme and the action features on these sets, and hope that they have great sales with it this year! That wraps up the Lego breakfast tour coverage. 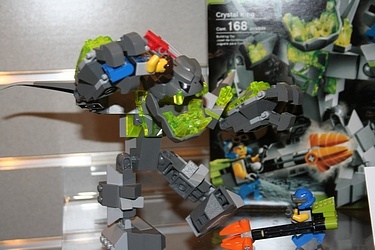 Be sure to check out the home gallery for Lego at Toy Fair 2009 where you can delve into galleries of any of the 15 lines that they had on display!